Cooking for just two is a doddle when you start with good-quality, flavour-packed ingredients such as these. Serve with jasmine rice or Thai sticky rice, if you prefer. 1. In a large shallow bowl, mix together the grated ginger, mirin, soy sauce and rice or white wine vinegar. 2. 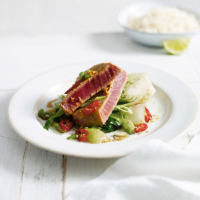 Heat a large griddle or non-stick frying pan and cook the tuna for 1-3 minutes on each side until cooked to your liking. Transfer to the bowl of dressing and leave to rest for 2 minutes. 3. Meanwhile, steam the pak choi for 2-3 minutes until just tender. Divide between 2 serving plates and top with the tuna. Drizzle over the dressing and scatter with the salad onion, chilli and sesame seeds. Serve with jasmine rice. Ensure the pan is very hot before adding the tuna steaks. The mirin in this recipe can be swapped for a medium sherry, such as Waitrose Medium Dry Amontillado.